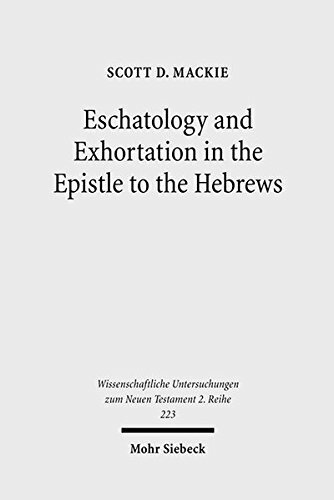 Scott D. Mackie analyzes the interface of eschatology and exhortation in Hebrews, paying special attention to the manner in which the author's eschatological convictions have shaped and empowered his hortatory effort. The author's eschatological thought-world coheres around two organizing principles: (1) Two-age eschatology: the Christ event has inaugurated the eschaton (9:26) and the end of the ages is imminent (10:26-39); (2) Heavenly Sanctuary eschatology: the Christ event culminates within this heavenly locale (9:11-12, 24; 10:19-21) and it also where the exalted Son reigns (1:3-13; 8:1; 10:12-13). The exhortations appearing in contexts where two-age eschatology is prominent emphasize urgency, immediacy, and existential irrevocability - conditions that naturally evoke calls for steadfast commitment (2:1-3; 3:14; 6:9-12; 10:35-39). Recitations of the community's experience of the eschaton are also prominent in these passages (2:4; 3:14; 6:4-5; 10:26-32). The hortatory agenda accompanying Heavenly Sanctuary eschatology is cultic in nature, focusing on the soteriological benefits of Jesus the high priest's sacrificial self-offering (1:3; 4:16; 5:9; 7:25, 27; 8:6; 9:12, 14-15, 24, 26, 28; 10:10, 12, 14, 18-25, 29). These soteriological benefits are intended to facilitate access to God in the Heavenly Sanctuary. The two exhortations to enter the Heavenly Sanctuary, 4:14-16 and 10:19-23, are then of strategic importance. It is there that the author's ultimate hortatory goal is reached, in the recipients' sacral confession of the Son of God, which forms and solidifies their identity as the family of God (3:1-6, 14; 4:14-16; 10:19-25). If you have any questions about this product by Brand: J.C.B. Mohr (P. Siebeck), contact us by completing and submitting the form below. If you are looking for a specif part number, please include it with your message.